This is the first of two Indian lagers to be reviewed in the near future. Kingfisher Premium Lager is from Bangalore and what I know about Bangalore is that it's very hot in the summer months, so I'm expecting this to be a nice refreshing lager. 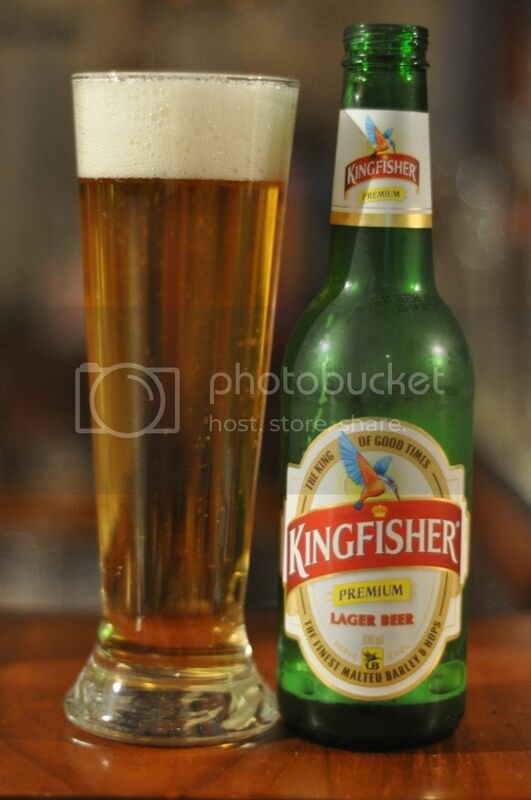 Kingfisher is brewed under license in Australia but I have got one of the rare imported ones. I read somewhere that this is one of the most popular imported beers in the United States, but I'm not sure what to make of that, as the people who drink this probably also think Budweiser is a top quality lager... Here's hoping it's a bit better than that. So on to the pour and this pours a very standard golden straw colouw with a nice tight 3 finger white head. The head has reasonable retention but when it does start to disappear it disappears very quickly and leaves no trace of ever having been there. It's a very standard looking macro lager, which is exactly what I expected. You couldn't complain receiving a lager that looks like this. When smelling the beer I'm impressed to find absolutely no noticeable smell of skunk, the biggest problem with imported lagers in Australia. Other than that it's a pretty simple smelling lager, with some slightly sour grains and mild hops. The hops seem to be of a herbal variety but I'm not sure how much bitterness they will provid. It's a clean smelling lager though and thats a big positive. Kingfisher is a nice tasting lager and is actually a bit better than I had expected. There are more hops present than the nose indicated and they are quite bitter. This bitterness is also excentuated by some bitter graining as well. There are some bready malts upfront but not alot. The body is light with medium carbonation and it's quite a clean lager in the mouth, no grainy feel despite the large amounts of grain in the beer. Overall it's a pretty good lager, in fact it's a lot better than I expected. India is hot and so you would expect that they can make a refreshing simple lager; this is that and more! It's very refreshing and you can really taste the quality of ingredients that have gone into this beer. Kingfisher is available nationwide at Dan Murphy's and if you're looking for a new and/or cheap lager, it's not a bad option to go with. I think more will find it's way into my fridge in the future.